So far this season the Pittsburgh Steelers have suffered more injuries than expected especially at the quarterback position. Most teams crumble when their starting quarterback misses several games -just ask Dallas Cowboys fans. But the Steelers remain in the thick of the playoff hunt. If they are going to stay there, more production from certain backups will be needed. The starting wide receivers Antonio Brown and Martavis Bryant form a great duo. However, every great offense tends to have an effective inside receiver. Markus Wheaton has not answered the bell this year and Darrius Heyward-Bey is more of an outside receiver/deep threat. Tyler Murphy is intriguing but remains on the practice squad. Out of the two mentioned, at least one must step up and take pressure off Bryant and Brown. Backup tight end Jesse James has already shown himself to be a potential upgrade over Matt Spaeth who offers little in the passing game. James’ route running must improve and he must show the ability to be more sure-handed going forward. As of now, at the least, he is an intriguing red zone target and capable blocker. As well as DeAngelo Williams has played, he simply cannot carry the load by himself. Jordan Todman and Isaiah Pead must prove they can handle third down responsibilities and short yardage situations. On defense, it’s safe to say that cornerback Brandon Boykin has been in the doghouse with Coach Mike Tomlin. Boykin excels in practice, but his presence will be needed on the field going forward. His ball skills and his ability to play inside and outside will be needed as the Steelers will need to create more turnovers. As strange as this may sound, James Harrison will be counted on heavily as a backup. Jarvis Jones simply is not the pass rusher the Steelers thought he would be. Harrison is no spring chicken but he still possesses the strength to bull-rush and the intensity to cause havoc in the backfield. 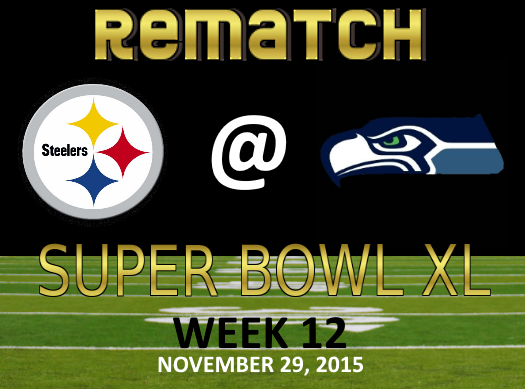 The Steelers are about to be tested by the elite as they move into the remainder of the 2015 season, beginning with a Super Bowl XL rematch with the Seattle Seahawks. Can The Steelers Offense Turn It Around?